Help your 50L Braumeister get up to strike temp and to a boil faster; and use less energy to maintain the boil with this neoprene sleeve from Speidel. Fits both new models as well as pre-2015 models. Does this fit both the new 50L and the pre-2015 model? BEST ANSWER: Yes, the jacket will fit both old and new 50L Braumeister models. This wrap is thicker than I was expecting which is nice. The Velcro is wide and the stitching seems robust. The fit is tight against the kettle with no gaps. The price is a little on the high side in my opinion, but its better than fooling with the home made insulation bubble wrap that I was using. We would expect nothing less from Speidel, thank you for the great review. 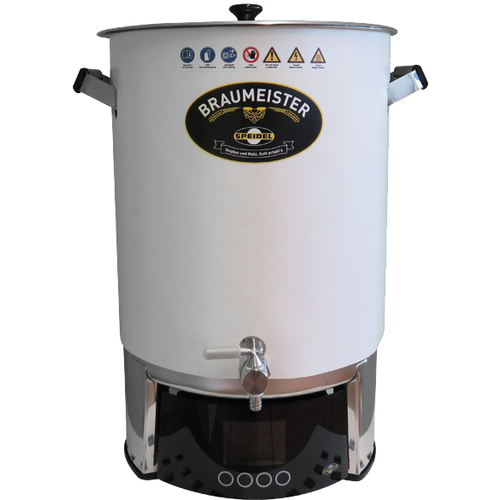 If you own a Braumeister, I highly recommend the insulating jacket. Speeds heating and helps hold those mash temps more efficiently. Looks much better than what I've made in the past. Speeds up the process to hit strike temp and also hold boil. A lot of heat is lost out the sides without it. Just try and cool your wort with the jacket on to see the difference! So don't forget when trying to drop wort temps.